I really don’t want to face the fact that Eleanor is nine years old. Nine is the best year of childhood, in my opinion. You’re old enough to start having a taste of independence, but still too young to have any real responsibility. But I still think it’s dangerously close to becoming all grown up. I haven’t gotten nearly enough snuggles from my Ellabelle-girl to permit her to grow up. It’s just not time. 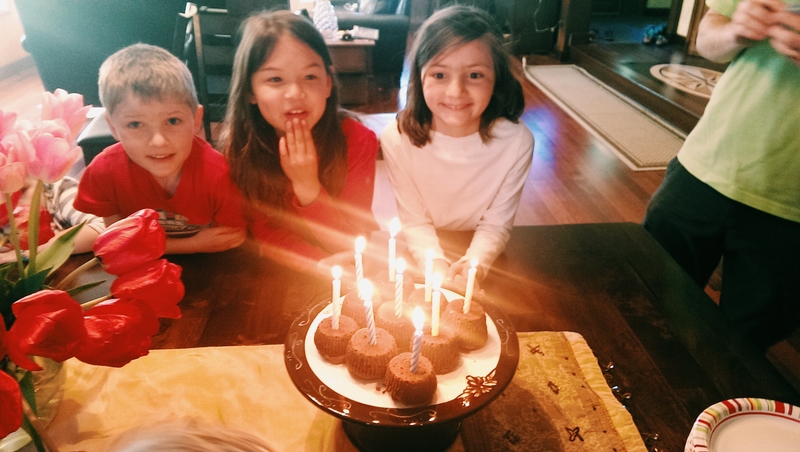 Eleanor chose to have a “backwards party” to celebrate her ninth. When the guests arrived at the door, we cheerfully waved and said, “Goodbye! We’re glad you’re leaving! We hope you have a dreadful time!” This caused all the kids to crack up. And they were all delighted to find the tablecloth and dishes set up underneath the table. All of them dove right under and spent a good twenty minutes chatting, giggling, and trying to say each others’ names backwards. 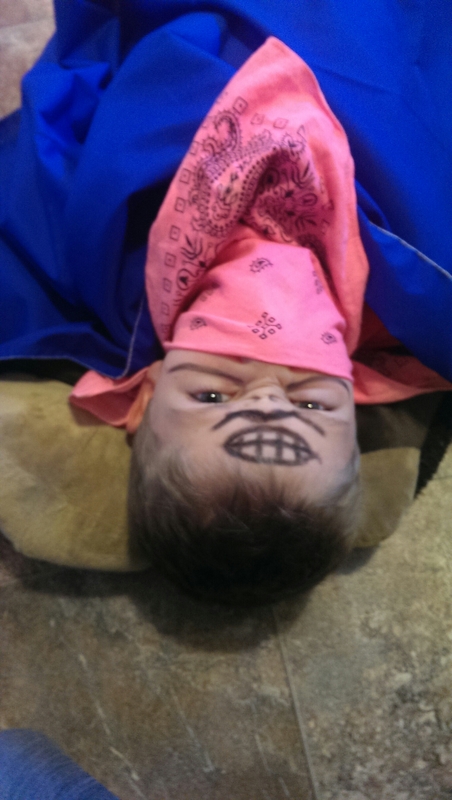 This was genius, probably the easiest party we’ve ever thrown. For the future: just come up with a concept that encourages kids to play on their own, then step back. Easy-peasy. 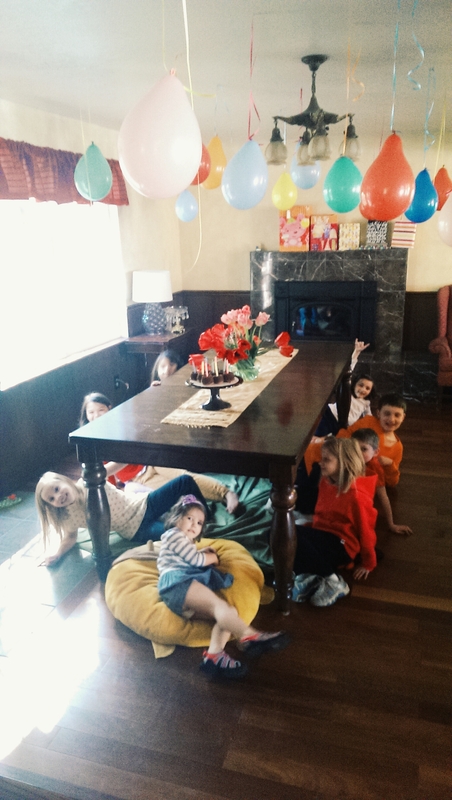 When the girls finally emerged from under the table, we casually suggested they play “Seek and Hide,” and when they grew tired of that, “Silent Chairs.” All we really had to do was suggest it, and they played on their own. 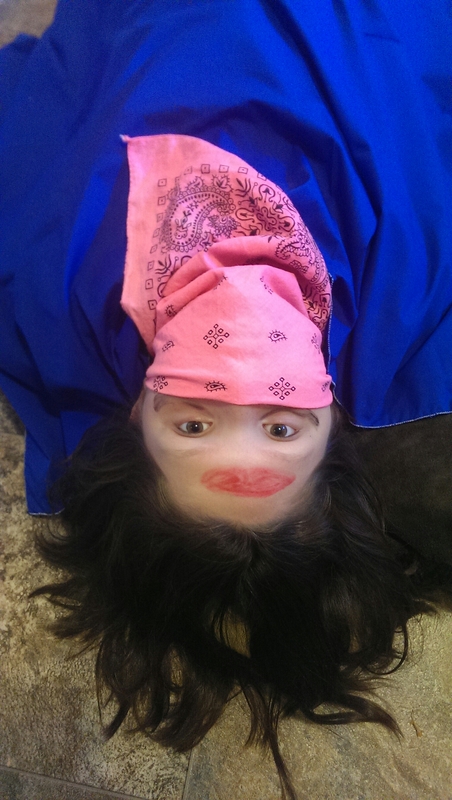 Eight and nine year olds are so easy to entertain! Brian and I just sat back and sipped cold glasses of Diet Coke while the girls entertained themselves. Much giggling and guffawing ensued. After we ate upside-down cupcakes (with candles stuck through the wrappers) . 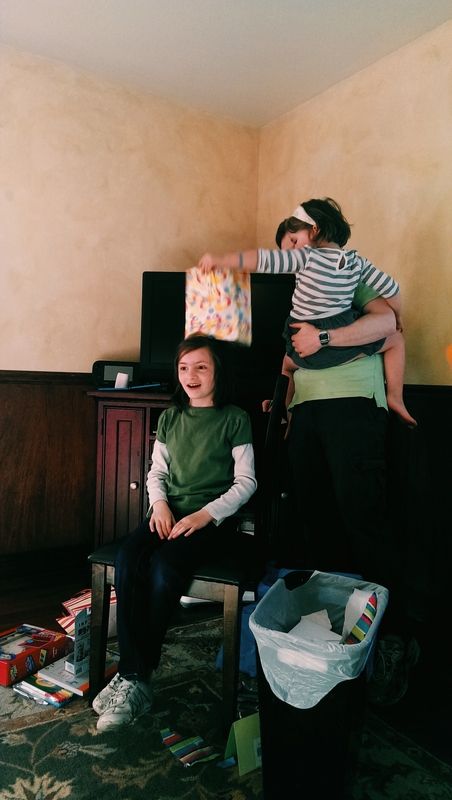 . .
Katie was especially thrilled to “bonk” her sister on the head with a present. So goes the cycle of sibling affection.